Shown here is a large-scale cosmological mass distribution from a computer simulation investigating the growth of supermassive black holes in the early universe. The projected gas density over the whole volume is shown in the background image. The two images on top show two close-ups of the regions where the most massive black hole is formed. The black hole is at the center of the image and is being fed by cold gas streams. The universe's first supermassive black holes grew so fast by gobbling up a steady stream of cold gas, a new study suggests. Researchers have long wondered what fueled the rapid growth of these huge black holes, which were already monsters shortly after the first galaxies came together. The new study, based on supercomputer simulations, may provide an answer — thin strands of cold gas flowing straight into the black holes' maws at breakneck speed. "We didn't know they were going to show up," study co-author Rupert Croft, of Carnegie Mellon University in Pittsburgh, said in a Dec. 12 statement. "It was amazing to measure their masses and go 'Wow! These are the exact right size and show up exactly at the right point in time.' It's a success story for the modern theory of cosmology." Supermassive black holes are thought to sit at the center of most, if not all, galaxies, including our own Milky Way. They are mind-bogglingly gigantic; scientists recently discovered two that each hold about as much mass as 10 billion suns. Supermassive black holes have existed since the universe's very early days, just 700 million years after the Big Bang, scientists say. (The universe is about 13.7 billion years old). That's surprisingly early, the researchers added, since the first stars and galaxies had just formed a few hundred million years before. Di Matteo and her colleagues wanted to solve this puzzle. 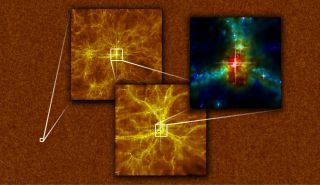 So they used supercomputers to perform a large-scale cosmological simulation that re-created the first billion years after the Big Bang. "This simulation is truly gigantic. It's the largest in terms of the level of physics and the actual volume," Di Matteo said. "We did that because we were interested in looking at rare things in the universe, like the first black holes. Because they are so rare, you need to search over a large volume of space." Normally, when cold gas flows toward a black hole, it collides with other gas in the surrounding galaxy, causing it to heat up before entering the black hole. This process, caused shock heating, puts the brakes on black hole growth somewhat. But the team's simulations suggested that early supermassive black holes encountered no such check on their growth. Rather, streams of cold gas were likely channeled straight into their gullets along the filaments that give structure to the universe, causing the black holes to grow faster than anything in the early universe, researchers said.